Avoid processed sugars while enjoying a yummy snack made from all-natural ingredients with Organic Bunny Fruit Snacks by Annie's Homegrown. The playful Organic Bunny Fruit Snacks are shaped like bunnies and made with real fruit juice. They contain no artificial flavors, colors or preservatives. All of the ingredients are from non-GMO sources and are vegan friendly. Each pouch contains 100 percent of your recommended daily intake of vitamin C.
Feel free to play with your food when you enjoy fun and nutritious Organic Bunny Fruit Snacks by Annie's Homegrown. Save big when you stock up on this great treat at eVitamins today! Warnings: Ingredients, nutrition facts, and allergen statements can change. Always refer to the actual package for the most complete and accurate information. 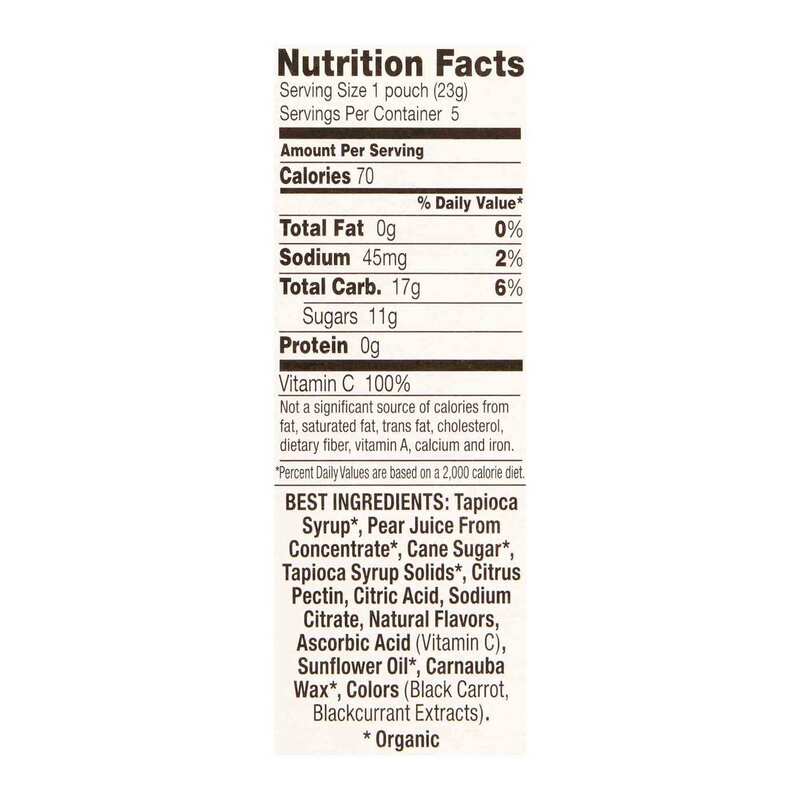 Notes: Contains no artificial flavors, gelatin, gluten, fat, synthetic colors or preservatives. Suitable for vegans. Non-GMO verified and certified organic. Recommended Use: Enjoy these succulent fruit snacks as part of a balanced diet. 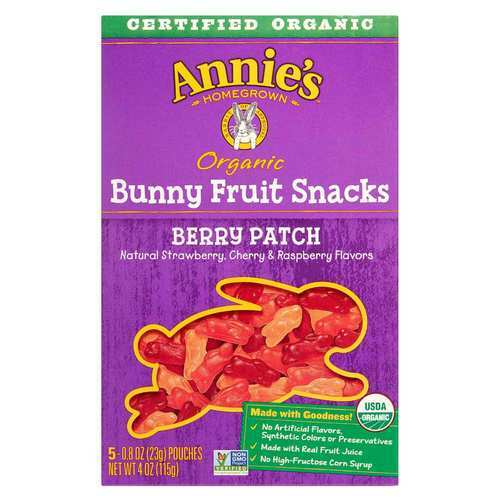 The customer reviews posted below are based on individual consumer experiences and may NOT necessarily represent what expected results will be from using or taking Annies Homegrown Organic Bunny Fruit Snacks Berry Patch - 5 Pouches. These results may not be typical and you should not necessarily expect to receive the same results. Actual results may vary. In a pack of 5 bags that are very convenient to give to children as a bonus, the jelly beans are very soft, fresh and tasty. They ate this delicacy very quickly, the children really like animal jelly in the shape of animals, they always look and then eat. 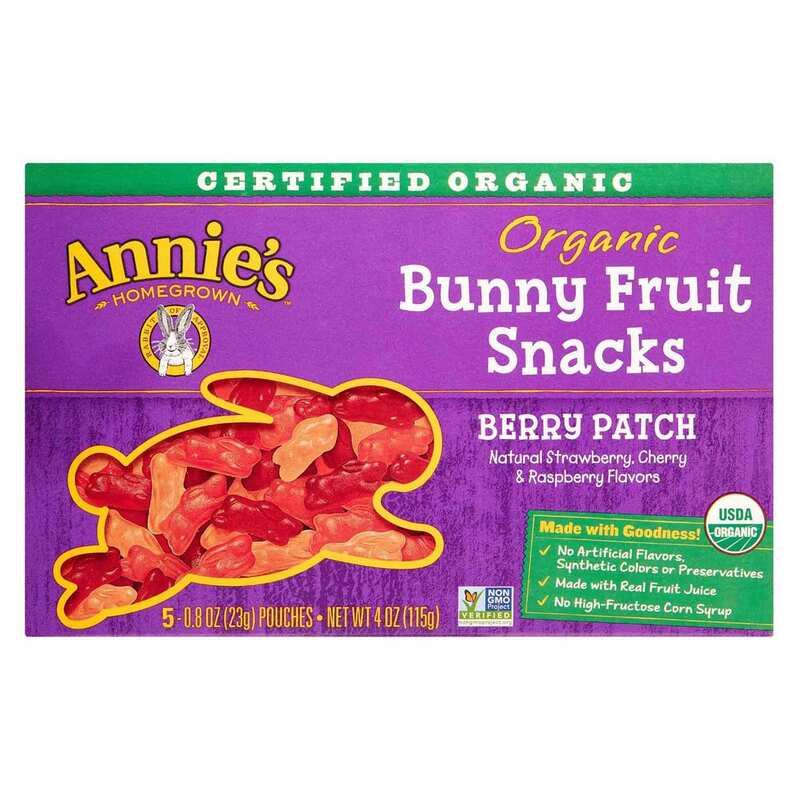 We cant get enough of the these Annie's Organic Bunny Fruit Snacks! They are an outstanding alternative to other snacks that aren't organic and they taste great! This box of 5 makes it easy to give our kids something sweet for a lunch time treat and easy enough to throw a couple into our travel snack bags when it's time to hit the road for when hunger strikes the whole family! We simply can't get enough of these great fruit snacks!